A busy diagram from NASA's Shuttle Reference Manual shows the location and plumbing related to the orbiter's fuel cell system underneath the cargo bay liner. This story was updated at 9:44 a.m. EDT. CAPECANAVERAL, Fla. - Sixastronauts and NASA's shuttleAtlantis will have to wait at least one more day before launching toward the International SpaceStation (ISS) while engineers puzzle a fuel cell glitch aboard the spacecraft. Atlantis'launch is now reset for no earlier than Thursday at 12:03:03 p.m. EDT (1603:03GMT) as shuttle specialists tackle a voltage issue with one of three fuel cellswhich generate the electricity to power the shuttle during its 11-day ISSconstruction mission. The shuttle's launch window closes Friday. "We wereready to go," NASA spokesperson Bruce Buckingham said here at the Kennedy SpaceCenter (KSC), where Atlantis stands poised to launch at Pad 39B. "We were justwaiting." NASAmission managers held off fueling Atlantis' 15-story external tank with cryogenicliquid oxygen and liquid hydrogen propellant - originally slated for 2:30 a.m.EDT (0630 GMT) - while discussing the fuel cell glitch, which first appeared asengineers powered up the shuttle before 1:30 a.m. EDT (0530 GMT) this morning. Atlantiswas slatedto launch its STS-115 mission at 12:28:46 p.m. EDT (1628:46 GMT) today. "We heldoff as long as we could," Buckingham said. "We're going to troubleshoot this,see if we can understand what happened and when we can rectify it." A voltage spike in the alternating current of Fuel Cell 1 prompted the concern,NASA officials said, adding that the short occured in a coolant motor for that unit. According to NASA flight rules, all three of Atlantis' fuel cells must be functioning properly before the shuttle can launch. Engineers are drawing up options to work around, repair or replace the hardware, shuttle officials said. Shuttle managers scrubbed Atlantis' Wednesday launch for at least24 hours to give engineers more time to study the fuel cell issue. The shuttlehad a 70percent chance of favorable launch weather today and is expected to havethe same odds over the next two days. Shuttle managers will gather at 1:00 p.m. EDT (1700 GMT) today during a Misison Management Team meeting to discuss Atlantis' options. A press briefing is expected to follow that discussion. By callingoff today's launch attempt before loading Atlantis' shuttle fuel tank with its526,000 gallons of super-cold fuel, NASA does avoid the typical $600,000 costof a scrub after tanking is complete, Buckingham added. Atlantis' STS-115mission - commanded by veteranshuttle astronaut Brent Jett - is aimed at delivering a $371.8million pair of massive portside trusses and two new solar arrays to theISS. The spaceflight will mark NASA's first dedicated ISS construction effortsince the 2003 Columbiaaccident and follows tworeturn to flight test missions. The lastmajor piece of ISS hardware - the Port 1 (P1)truss - launched aboard NASA's Endeavour orbiter during the STS-113mission in late 2002. Atlantis' Port 3/Port 4 (P3/P4) trusses are destinedto be installed at the end of their P1 cousin. Today's scrub follows several delays for Atlantis' STS-115 mission, following a lightning strike to the shuttle's launch pad and storm threats from a tropical depression last month. Each NASAspace shuttle is powered by three fuel cells tucked beneath its cargo bay. Thereusable, restartable fuel cells weigh about 255 pounds and run 45 inches long,15 inches wide and about 14 inches high, according to manufacturespecifications. While theshuttle carries three fuel cells, only one is required to power the spacecraft,according to builder UTC Power. They use liquid hydrogen and liquid oxygen toproduce a steady 12-kilowatt supply of power each, can put out 16 kilowatts forshort periods, and generate heat and water - used for drinking by astronautcrews - as byproducts. Ifextensive repairs - such as a fuel cell replacement - are needed Atlantis wouldlikely miss its current STS-115launch window, which closes on Sept. 8. NASA's current daylight launchrestrictions for Atlantis actually allow for a launch up to Sept. 13, butshuttle officials will stand down Friday to avoid conflictswith the planned Sept. 18 launch of a Russian Soyuz spacecraft that will ferrya new crew and one space tourist to the ISS. Wayne Hale,NASA's space shuttle program manager, said earlier this week that a study iscurrently underway to reevaluatethe daylight launch rules for Atlantis' STS-115 mission. Those restrictionswere in place to evaluate fuel tank modifications, but may not be relevant whenthe next lighted launch window opens on Oct. 26, Hale has said. If awell-lit launch is not required, Atlantis could rocket toward the ISS sometimeafter Sept. 29, when Russia's ISS crew change mission concludes, Hale has said. NASA officials said fuel cellglitches have afflicted several shuttle missions in the past, including: Columbia's STS-2flight in 1981, Discovery's STS-42 mission in 1992, Endeavour's STS-69 flightin 1995, Columbia's STS-83 spaceflight in 1997 and Atlantis'STS-98 in 2001. The STS-69 glitchalso prompted NASA shuttle managers to scrub their attempted launch beforeloading Endeavour's external tank propellant, NASA records show. The space agencyactually re-launched the STS-83 mission as STS-94 after a fuel cell issue promptedcut the planned 16-day flight down to three days. 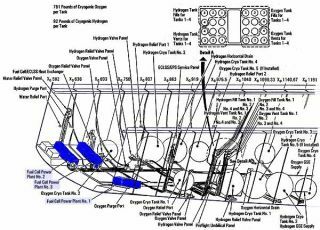 Erratic readings were seen inone of Endeavour's fuel cells before flight and developed into a full-blownproblem once in orbit. The plannedfive-day STS-2mission aboard Columbia was also shortened to three days due to a fuel cellfailure in flight. It tookNASA about one week to replace a fuel cell after scrubbing the planned Aug. 31,1995 launch Endeavour's STS-69 mission, just over 11 years before Atlantis' currentproblems. STS-69 launched on Sept. 7 of that year. NASA's post-MMT press briefing on Atlantis' launch scrub is expected to begin no earlierthan mid-afternoon. The briefing will air live on NASA TV, and you are invited to follow the event via SPACE.com's NASA TV feed by clicking here.